We are about to give you a statistic you may not want to hear. According to ACE Fitness the average American consumes 3,000 calories and 229 grams of fat during Thanksgiving dinner. That’s a lot! Although the holiday season may seem like a weight-gain trap, there are ways for you and your family to power through the rest of the season by following four of our post-Thanksgiving health tips. -Holiday weight gain can be avoided with perserverance and self-control! Make goals that are specific, measurable and relevant. For example, set the specific goal of running three times a week and cross-training every other day. By keeping track of you running distances, you can begin setting measurable goals for yourself. If you are looking to feel confident in a bathing suit by the spring, set a relevant goal to spend the winter season toning your ab, arm and leg muscles. -Working out with others can help keep us accountable! As the holidays revolve around quality time with our loved ones, what a better way to spend time with them than being active together. Make plans 1-2 days in advance to go for a run together, hit the gym or throw around a football. If family is coming together for the holidays, create a Facebook group everyone can be apart of and share ideas on how to get out and active during the holiday vacation. -There are many fun run options throughout the holidays! 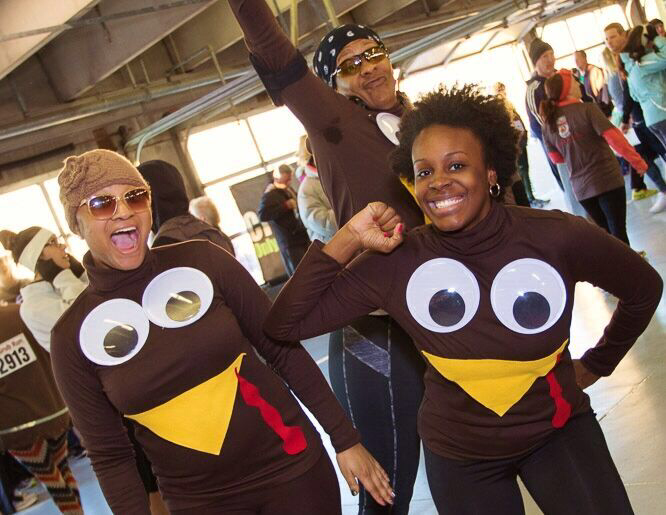 We recently held our 7th annual Grub Run at Texas Motor Speedway and are holding our Reindeer Romp in Trophy City, Texas on Saturday, December 05, 2015. Events like these are great to invite friends and family members to participate. -There are many recipes that offer delicious substitutions to the typical holiday food. For example, this garlic mashed cauliflower recipe may blow typical mashed potatoes out of the water! We suggest you create a Pinterest board of “Holiday Recipes” and pin away! In addition to making healthy dishes at home, it is best to keep eating out and drinking to a minimum. This will not only help you save money for holiday shopping, but it can give you the opportunity to create amazing healthy dishes with and for the ones you love. The South Padre Marathon team is here to help you not only train for a marathon, but become the healthiest you. Follow our Train and Fuel blog for tips throughout the year! If you have topic ideas, email us here. We look forward to helping you push through the holiday season and into a brand new year!